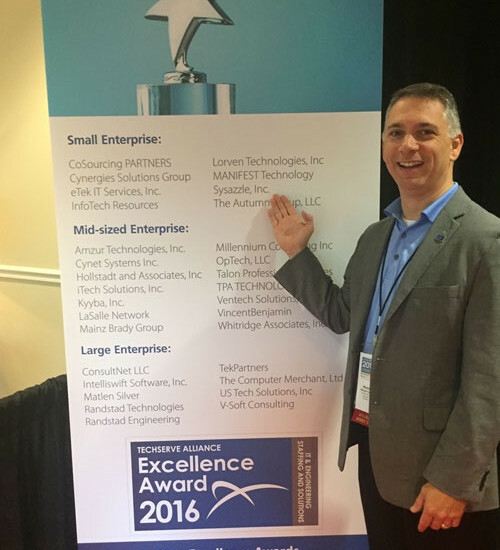 Alexandria, VA, October 26, 2016 – TechServe Alliance, the national trade association of the IT & engineering staffing and solutions industry, today announced the recipients of its annual Excellence Awards. The awards program was developed to recognize IT & engineering staffing and solutions firms that have demonstrated excellence through outstanding performance, team productivity and dedication to continuous improvement. Recipients will be honored at an industry-wide celebration during the TechServe Alliance Annual Conference in Amelia Island, Florida November 3-5, 2016. “TechServe Alliance is thrilled to honor our 2016 class of Excellence Awards winners. These companies are among the very best in our industry,” said Mark Roberts, CEO of TechServe Alliance. “Despite all of the competitive pressures facing fims in our industry, these award recipients have truly differentiated themselves in the marketpalce. What they have accomplished is truly remarkable,” said Roberts. Now in its third year, the Excellence Awards are bestowed annually to the industry’s top-performing firms. TPA Technologies Ventech Solutions, Inc.